Laughs, love, danger and adventure – TIMES TWO! 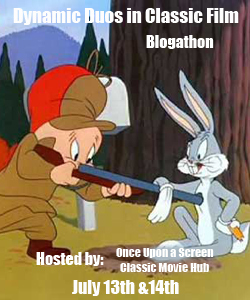 It’s the Dynamic Duos in Classic Film blogathon! 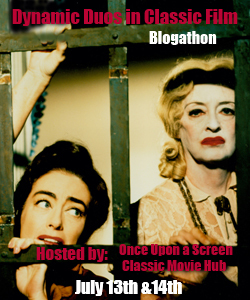 In a co-host gig with the fabulous Classic Movie Hub (@ClassicMovieHub), Once Upon a Screen (@CitizenScreen) is happy to announce this upcoming blogathon event dedicated to perilous, precarious and/or personable pairs. Or non-human, for that matter. But they must be classic – in the traditional sense, which for this event is designated to any film, character, personality, etc. before 1970 in order to stay true to the themes of both host sites. 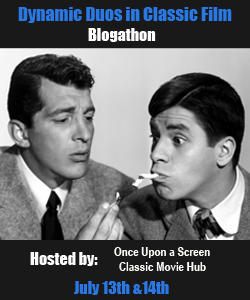 You can be as creative as you want – any on-screen duo you wish to write about is welcome.